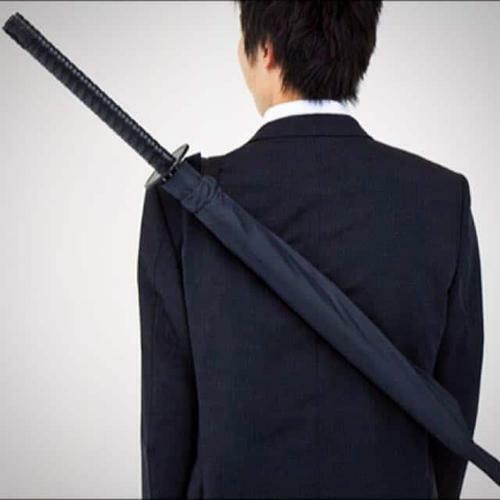 Express your inner Ninja with the Samurai Sword Umbrella! We all need an umbrella in the fall, why not carry one that will help you to thwart off enemies (and have some fun while you're at it). The perfect back to school gift or commuting accomplice. Bring some humor to your day, and battle those rain storms like the true Samurai Warrior you are! Has and Auto Open Button so you can unsheath like a samurai. Due to extremely high social media attention, we are running low on stock. Order today to secure this offer before the price goes back up! Black is available in 3 different ribbed options. While Silver is available in just 8 ribs. Large: 38" (97cm) long, 41" (104cm) wide when open. Small: 17" (43cm) long, 38" (96.5cm) wide when open.